Jesuit needed three falls in the final three matches to avoid giving Holy Cross a "moral victory" at the Jesuit gymnasium Wednesday night. Guy Patron, Jr., Evan Slattery and Corey Dublin provided just that, enabling the Blue Jays to erase an 11-point deficit to score a 39-32 dual meet win. 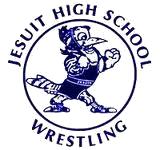 The seven-point victory negated the six points the Blue Jays were given via a forfeit at 126 lbs. Jesuit seniors with their parents (kneeling, left-right): Griffin Mason, Evan Slattery, Kyler Pisciotta, Austin Ashburn, William Rosevalley, Joseph Dupre, Guy Patron, Jr., Brandon Wolff and Caleb Hart. Even Blue Jay losses counted positively to their winning effort. Had either William Rosevalley or Griffin Mason been pinned rather than lose by major decisions, Holy Cross would have walked away with only a five point loss. The best match of the night, however, was at 132 lbs. between the Blue Jays' Jackson DeGruy and Cole Clement, one of three likely Division I Holy Cross #1 seeds in Bossier City next week. Clement already had a tough time with DeGruy at the Ken Cole, winning 12-10 in a quarterfinal match (Clement placed first, DeGruy fourth), and Clement defeated DeGruy at the Mandeville Open. This time the Blue Jay started fast and built a 10-4 lead with little more than 90 seconds remaining in the match. Clement escaped and took down DeGruy to cut the Blue Jay's lead to 10-7 with 1:07 left. Clement would cut DeGruy loose three more times, but in the interim could only score two takedowns to cut the difference to two points, 13-11. On his feet with 13 seconds remaining, DeGruy was able to fend off a potential match-tying takedown by Clement to score three very important points for the Blue Jays. In the last two weeks DeGruy, whose Louisiana record after this match is 13-9, defeated the likely Division I #1 seed Clement and the likely #2 seed Seth Gambill of Brother Martin on January 20th. He also has 1-1 season splits with Landon Wheat of East Ascension and Catholic's Lance Blanchard . The Tigers started off with a very good performance by Michael Lundin at 106 lbs., and later Michael Benton scored a tough 8-6 win over Brandon Wolff at 160 lbs.. Joseph Dupre scored a fall for the Blue Jays, as did Evan Palmisano. Jacob Spahn, David Clement and Matthew Putnam scored falls for the Tigers, and top-ranked Jake Rando and Joey Foret scored the two major decisions. Lack of "morale victory" aside, the Tigers won seven of the 13 matches contested.